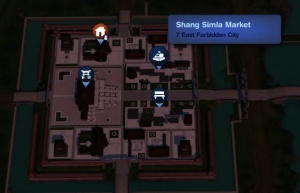 Shang Simla Market, one of the various places to buy relics. Relics are collectible items found in EP1: World Adventures. You can find Relics through Tomb Adventuring, excavating archaeological sites, or by purchasing them from the Relic Merchant in the Marketplace of each of the three destinations. Relics can be used for any adventures you come across or just for general decoration for your home. Below is the list of relics, their location and their minimum and maximum value. Common relics are simple collectible items without incredibly impressive names. They are, as their name suggests, quite common and can be found just about anywhere in all three destinations. The very old ones can be extremely valuable, and they do look nice in your sims' homes. These relics are much rarer and more valuable than Common Relics. Each of the nine collections has a set of Relics, and they may not all be found in one destination. Once you have completed a collection, display it in your sims' homes to receive a Wonderous Collection moodlet when your sims are in the room with the collection. It is possible to find multiples of the same item in a collection - you can use these extras for a quick profit, or as part of a mixed collection in Transfiguration. Relic Collection Connoisseur Relic Collection Connoisseurs have completed 6 relic collections. Relic Collection Connoisseurs gain 50% more mood increase from the Wonderous Collection moodlet. Historical Hoarder A Historical Hoarder has Collected 20 Relics of each culture. Relics discovered by Historical Hoarders are 50% more valuable. This page was last modified on 19 September 2012, at 14:57. This page has been accessed 100,173 times.